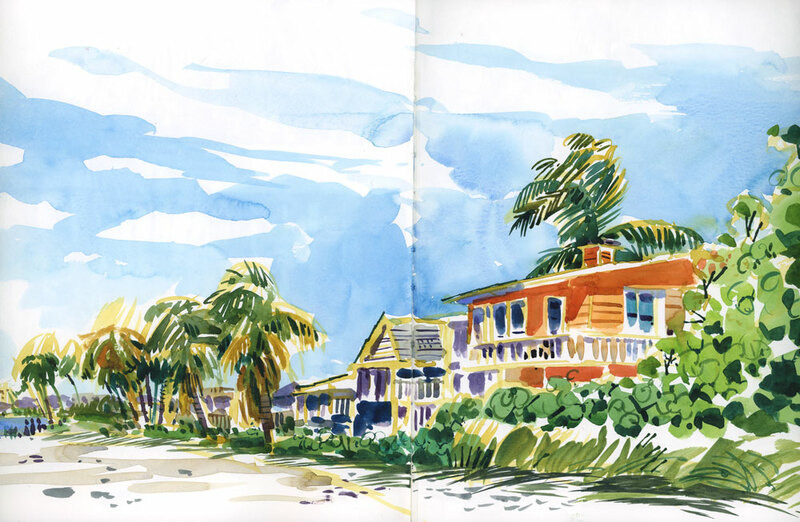 [by Shari Blaukopf in Sanibel Island Florida] After a long and busy teaching semester (and hardly any time to sketch), going to Sanibel Island, Florida with my family was a welcome escape from the Montreal winter. It was a thrill to really have uninterrupted time to fill up my sketchbooks. The best thing about the island, for me, was the bicycles. Everyone seems to move around on rented bikes, filling their baskets with their beach towels, their grocery shopping and of course for me, my sketch gear. The traffic on the designated bike paths is sometimes more crowded than the cars on the road. But since everyone seems to be on holiday, it's never a problem. No road rage on these paths! I spent almost every day sketching in a new spot. While my family enjoyed the water view, I turned my chair around and sketched the white house and the sea grapes on Fort Myers Beach (above). One morning I rode my bike to the Sanibel Island Historical Museum and Village. On the site you'll find eight restored buildings from the days before the bridge and causeway were built. 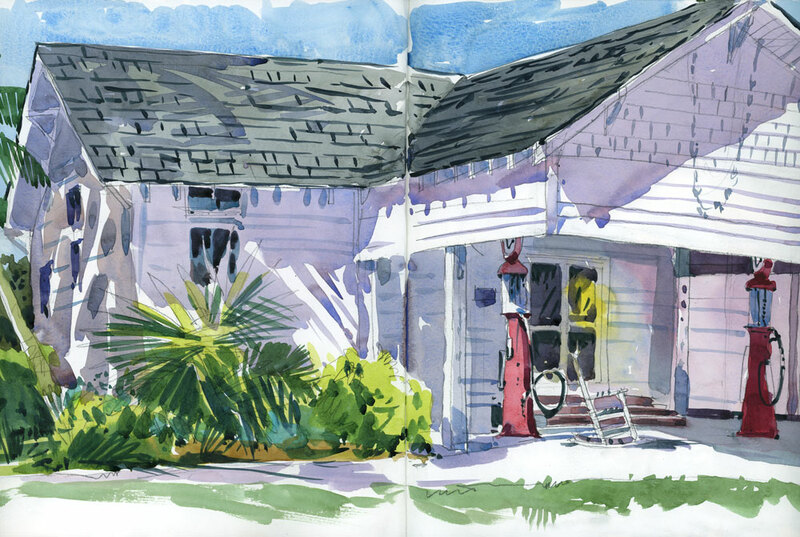 There's an old post office, a tea room, some houses and the Old Bailey's General Store, which I chose to sketch because of the old red gas pumps out front. 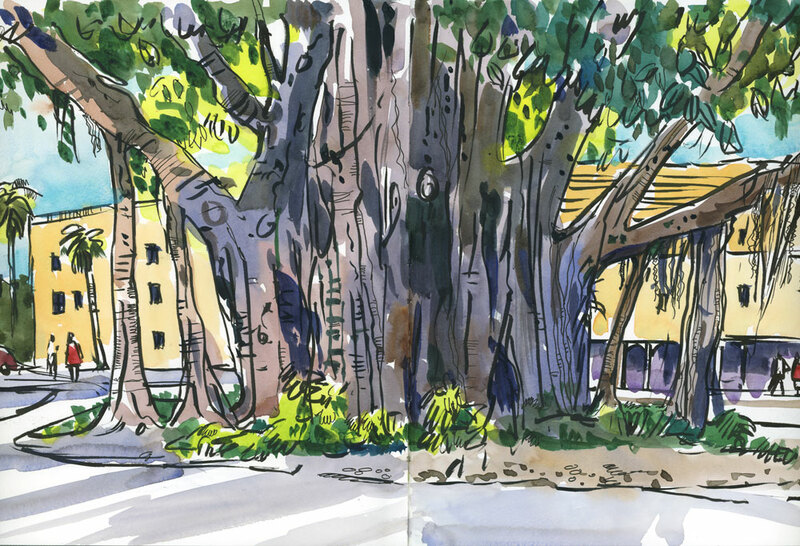 One day we drove into downtown Fort Myers where I found this huge banyan tree to sketch. It was the last hour of daylight so I worked fast, using a brush pen to draw before the sun went down. I had just enough time to add colour before I lost the light. 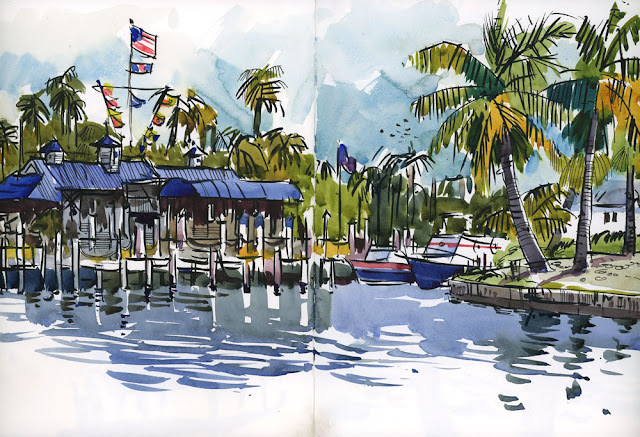 I spent a lot of time watching the boats on the canal near our accommodation, and a few times as I was sketching I was lucky enough to see the dolphins that swim in from San Carlos Bay. Fort Myers beach is wide and not too crowded. 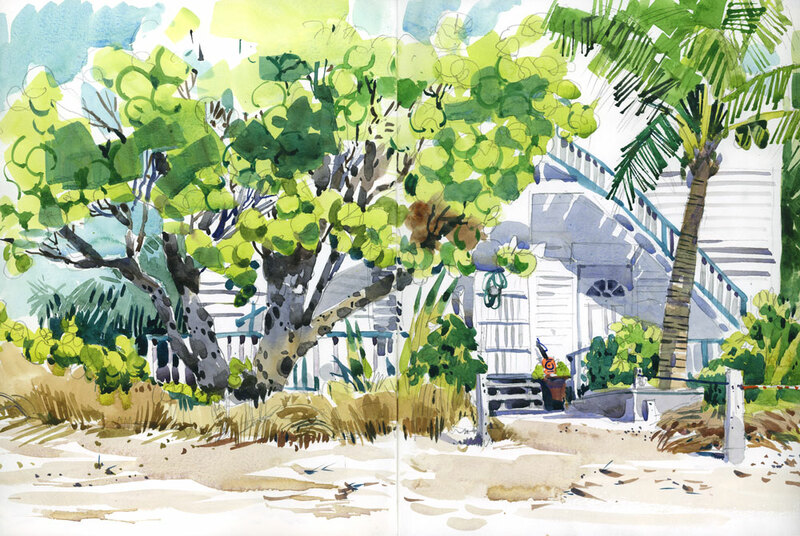 I sketched the houses on the beach as well as the plant with the big round leaves which I learned is called Sea Grape. During the holiday season the old lighthouse on Sanibel is decorated for the holidays. 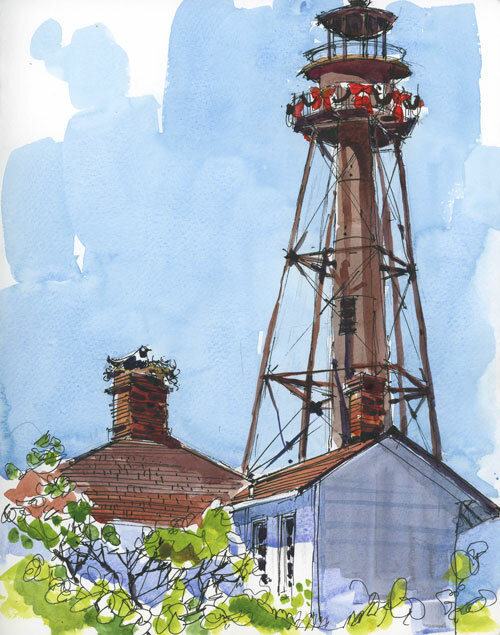 When I sketched it an osprey landed in its nest on the chimney of the lighthouse keepers house. 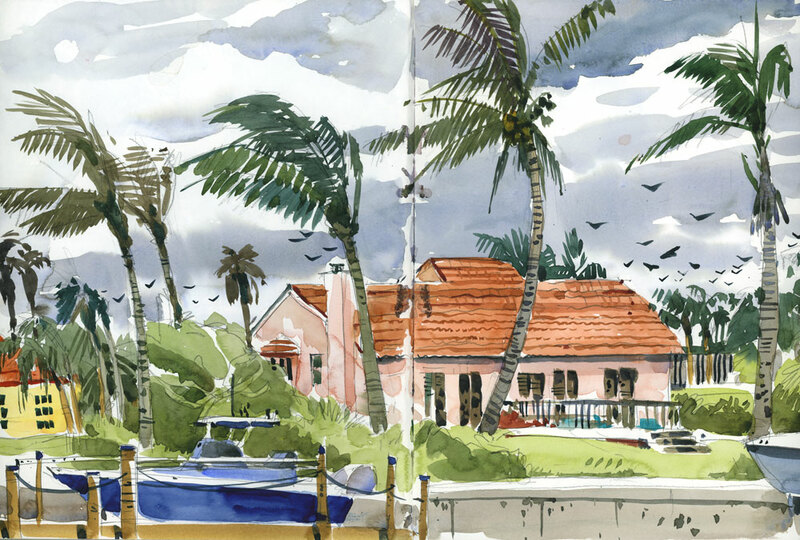 If you love birds, Sanibel is certainly a place to do some bird watching. We also spent a few hours cycling through the J. N. Ding Darling Wildlife Refuge, spotting Herons, Roseate Spoonbills and White Pelicans, as well as an alligator sunning himself in the marsh. 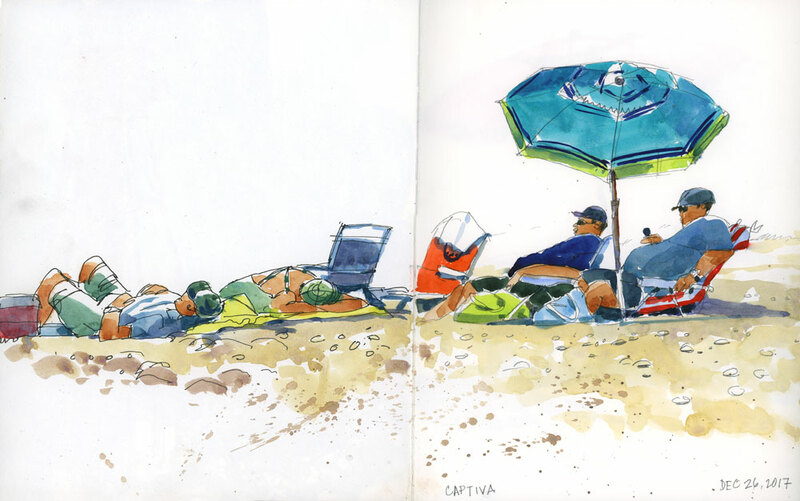 There was also plenty of people sketching on the beach. It's almost better than a life-drawing class because these bodies don't move for a very long time. 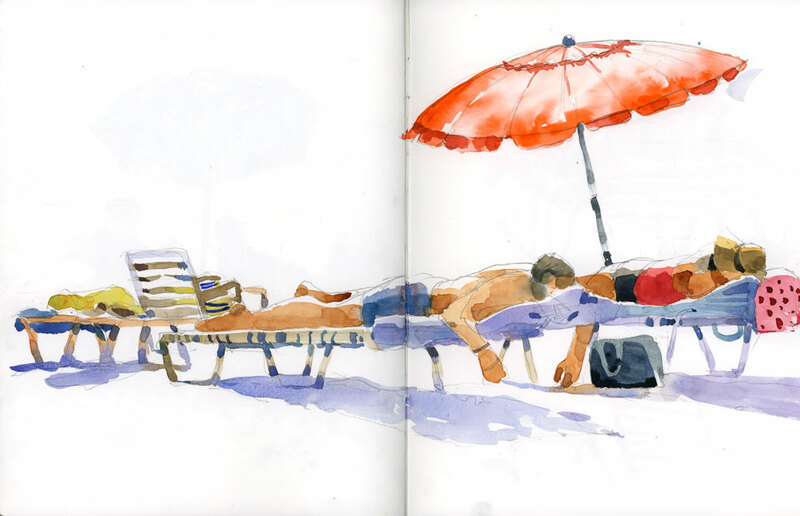 On day we drove up to Siesta Key to see family and I sketched more beach people there. Near the end of our stay, the blast of Arctic weather from the north made it down to Florida. The weather changed in an instant, bring clouds, rain and colder temperatures. I still sketched on the canal despite the cold (after all, I'm used to much colder sketching weather in Montreal), and that day had some unusual encounters with birds. You can read about the bird stories on my blog.